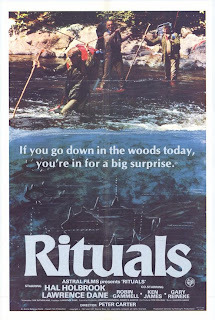 Tag line: "He Knows You're Out There ..."
My continuing trek through 50 Drive-in Classics brings me to a doozy of a horror film, 1977’s Rituals, also known as The Creeper (its title on the Mill Creek set), a Deliverance-style movie about a few good friends whose annual getaway turns into a living nightmare. Five doctors: Harry (Hal Holbrook), Mitzi (Lawrence Dane), Martin (Robin Gammell), Abel (Ken James) and D.J. (Gary Reineke), head into the Canadian wilderness for a little rest and relaxation, only to find themselves stranded in the middle of nowhere when someone makes off with their boots. Seeing as he was the only one to bring a second pair along, D.J. sets out in search of help, but shortly after he leaves, the remaining friends discover the severed head of a freshly-killed deer hanging just outside their campsite, which they take as a warning that someone is watching them. Wrapping their feet in clothes and plastic bags, the four decide to follow D.J. in the hopes of catching up with him, only to find their path blocked at every turn by a mysterious stalker, who has a few surprises up his sleeve that the buddies won’t soon forget. 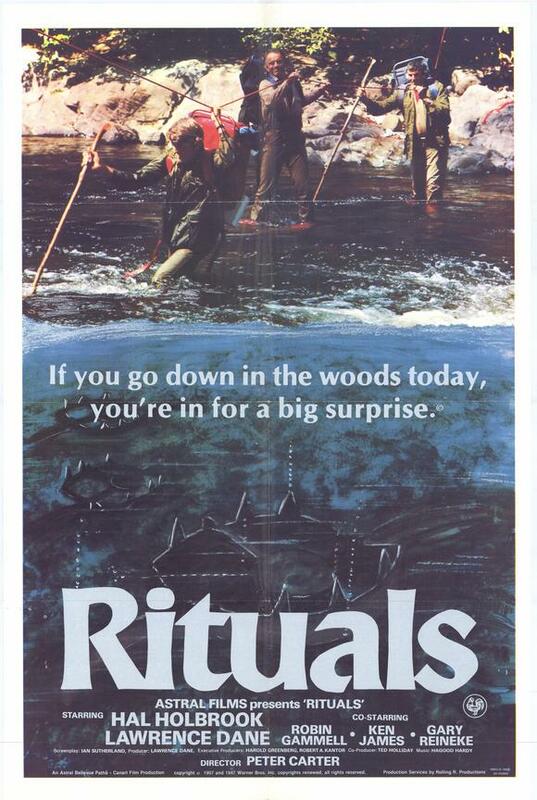 Rituals generates most of its scares by way of the unknown; for the majority of the film, we have no idea who’s following these five men, or why. Yet one thing’s for certain: whoever it is, he intends to do more than pull a few harmless pranks. Aside from the deer’s head, there’s a scene where a branch holding a hornet’s nest comes crashing to the ground, scattering hundreds of angry insects in every direction. All five actors do an exceptional job portraying men whose desperation soon causes them to turn on one another, and if this isn’t enough to pique your interest, Rituals also features a final sequence more nerve-wracking than anything that came before it, wrapping things up in a particularly disturbing manner. A few days ago, I wondered what hidden gems might be waiting for me as I explore the 50 Drive-In Classics collection. Well, this definitely qualifies. A tense, sometimes brutal motion picture, Rituals is a movie that will get under your skin, and stay there for quite some time. YEP!! I got the same set earlier this year and thought the same, great movie and one of the best in the 50-set. Nice review!